Scattered across the former Yugoslav states are hundreds of spomeniks, or memorials. These striking, abstract memorials, erected between the 1950s and the 1980s, commemorate the events of the Second World War (or national Liberation War, as its known locally). After the Axis forces of Germany, Italy, Bulgaria and Hungary invaded the Kingdom of Yugoslavia in 1941, a home-grown, anti-fascist partisan movement arose to fight back against occupation and domestic collaboration. Led by Josip Broz Tito amongst others, the partisans ultimately liberated the region, at great cost. In the aftermath, the multi-ethnic Socialist Federal Republic of Yugoslavia was formed, with Tito at its head. The partisan movement, with its values of “Brotherhood and Unity”, became the founding historical narrative of the new state. Spomeniks were intended to convey the modern, progressive socialism of the Yugoslav people. The monuments were often locally planned and commissioned, memorialising the victories, sacrifices and traumas of individual villages, towns and regions. In the post-Yugoslav world, spomeniks have gained a new lease of life as internet-famous “concrete clickbait” — shared online shorn of the crucial historical and ideological contexts that forged them. Now, a new book is attempting to honour the original spirit of the memorials. Spomenik Monument Database, written and photographed by Donald Niebyl and published by FUEL, collates 80 of the most notable spomeniks, detailing the wartime events they commemorate and documenting the design and construction processes. Below is a selection of eight spomeniks from across the former Yugoslavia, with extracts from the book explaining their true significance. On 22 June 1941, rebels near the town of Sisak initiated an uprising — the first armed resistance movement against Axis occupation during the Second World War. For the rest of the war, the area around the Moslavina village of Podgarić became a significant centre of partisan revolt. In the mid-1960s sculptor Dušan Džamonja was commissioned to create a spomenik complex to mark Podgarić’s significance in the fight against Ustaše forces. It was unveiled on 7 September 1967, at a grand ceremony attended by Josip Tito, who became President of Yugoslavia in 1953. The primary element of the complex is a winged abstract sculpture, approximately 10 metres tall and 20 metres wide, with a central convex “eye” covered in aluminium-plate segments. According to Džamonja, the monument was intended to represent the “wings of victory” — an allusion to the triumph of the partisan rebels over the occupying Axis forces. The approach pathway houses a crypt containing the remains of some 900 partisan soldiers who died in the surrounding hillside hospitals. Above ground, the pathway is punctuated by a dramatic, angular, ribbed-concrete arch, at the base of which is an engraved bronze memorial plaque. A small artificial lake was created in the valley below the complex by damming the Kamenjače River. This was intended to enhance the beauty of the view, while also acting as a tourist attraction for the Vila Garić resort hotel at the lake’s south end. The Kruševo Partisan Detachment formed on 19 August 1942 and fought against Axis troops across Macedonia until Kruševo’s liberation by Soviet-backed Bulgarians in 1944. Macedonia was officially declared a nation state during the Anti-fascist Assembly for the National Liberation of Macedonia (ASNOM), held on 2 August 1944, a date chosen as a symbolic link to the Ilinden Uprising [a 1903 revolt against the Ottoman Empire by Macedonian nationalists, led by Nikola Karev]. In the early 1970s, a commission was appointed to organise the construction of a memorial complex dedicated to these events. Husband and wife artists Jordan and Iskra Grabul were chosen to collaborate on the design of the monument, but the process was fraught with disagreement: the commission wanted a more figurative memorial than the abstract form proposed by the Grabuls. Eventually, a compromise was reached and the completed complex opened on 2 August 1974, marking the 30th anniversary of the ASNOM and the 71st anniversary of the Ilinden Uprising. Although the memorial is officially named “Ilinden”; it is also known as “Makedonium”, after the construction company that built it. At the entrance to the complex is a series of large concrete forms resembling broken chainlinks. Along the path to the Makedonium is a crypt area where 58 tapered pillars protrude from the side of a tilted wall, each capped with a bronze plaque. The plaques bear dates and locations referring to the Ilinden Uprising. Approaching the Makedonium dome, visitors walk through a large amphitheatre containing some 200 seating bollards, flanked by two curved concrete walls decorated with colourful abstract bas-reliefs (by the painter Petar Mazev). The Makedonium itself is a 25-metre-tall concrete building resembling the head of a mace. Protruding windows admit light into the building; four of these are glazed with abstract patterned stained-glass, designed by artist Borko Lazeski, to represent the four seasons. Above these are smaller protrusions lined with sculpted reliefs intended to represent four seminal ages of Macedonia: antiquity, Turkish rule, the time of conflict and that of independence. Centrally placed on the floor is a sculptural form evoking the “eternal flame”, which can be targeted with purpose-built lights to reveal the sunburst pattern of the Macedonian flag. Also within the Makedonium is a simple tomb for Nikola Karev, with a block inscribed with his name. Karev’s remains were interred here in 1990. On 16 April 1941, Italian forces occupied the Zeta Banovina region, intending to re-establish the Kingdom of Montenegro under Italian control. A popular uprising began on 14 July 1941. Over the course of the war, several hundred citizens of the Barutana region were killed. In 1945, Montenegro became one of six republics within the new Socialist Federal Republic of Yugoslavia. Following a nationwide competition, native Montenegrin architect Svetlana Kana Radević’s design was selected. The monument, commemorating those who died in these conflicts, was officially opened to the public in July of 1980, 26 years after the partisan liberation of the Barutana region. The central element consists of eight free-standing concrete pillars, 12 metres tall. Towards the top, they break from the vertical into sharply angled “C” shapes, giving the impression of a bud on a stem or supplicating hands. A large amphitheatre was built adjacent to this element for educational and political presentations. The complex had its own lighting, to facilitate its use in night-time events. On the stone-paved pathway that leads to the spomenik are three circular areas with smaller memorial elements, dedicated respectively to the victims of the First Balkan War, and the First and Second World Wars. As resistance groups instigated uprisings against the NDH’s Ustaše forces, attacks on ethnic targets intensified. However, reprisal killings of civilians were not yet a common occurrence in Sremska Mitrovica. This situation changed on 26 August 1942, with the arrival of Ustaše Provost Marshal Viktor Tomić. Following the sabotage of local rail and communication lines by partisans, Tomić issued orders for the arrest and execution of civilians across the city. The majority of killings took place in open fields adjacent to the city’s Serbian Orthodox cemetery. Prisoners were shot in the head and dropped into pits they had been forced to dig. After just two weeks under Tomić’s control, more than 10,000 civilians from the region had been arrested (mostly Serb, Jewish and Roma). It is estimated that by the end of the war, between 7,000 and 12,000 civilians had been liquidated at these killing fields. Directly after the war, the location of the mass killings was marked with a modest stone cross. In the late 1950s, the Yugoslav government and veterans’ groups from Sremska Mitrovica organised the creation of a more expansive spomenik park. Officially named the Necropolis at Sremska Mitrovica, it was designed by architect Bogdan Bogdanović. The initial unveiling took place on 4 July 1960, with further elements being added until October 1981. In April 1941, following the invasion of the Kingdom of Yugoslavia by Axis forces, the puppet Independent State of Croatia (NDH) was formed. This brought much of what is present-day Croatia and Bosnia under Axis control. Undesirables such as partisans, communists, anti-fascists, POWs and certain ethnic groups (Serbs, Jews, Roma, etc.) were detained in purpose-built camps. Established around July or August 1941, the Jasenovac camp complex used forced labour to produce timber, bricks and leather goods. But in November 1941, work ceased and Jasenovac began operating exclusively as a death camp. Ongoing research at the Jasenovac Memorial Site Museum currently assess the number of victims at somewhere between 80,000 and 100,000, which accords with the findings of most modern sources. This makes Jasenovac one of the largest single extermination camps in Europe during the Second World War. For the next two decades, only a few small make-shift wooden memorials, erected by locals and survivors, marked the site. In the late 1950s, following pressure from families and victims, the Yugoslav government began to plan an official memorial. In 1960, the proposal of architect Bogdan Bogdanović was chosen by President Josip Tito himself. The designer decided not to directly portray the atrocities that occurred at the site, considering them too horrific, as well as potentially contributing to ethnic tensions. Instead, he imagined a lyrical memorial, symbolising not only life and rebirth, but also reconciliation, the overcoming of suffering, and a “termination of the inheritance of hatred that passes from generation to generation”. After years of compromise, redesign and construction, the monument was publicly unveiled at a large remembrance ceremony on 4 July 1966. Tito was conspicuous by his absence. In his memoir The Doomed Architect (1997) Bogdanović recalls that during the inaugural address of the ceremony (held a kilometre away from the sculpture), a crowd of thousands burst through the ring of guards. Running across open ground, they reached the monument, swarming around it, screaming and wailing. Bogdanović described the scene as an “unearthly sight” and expressed concern that the structure might be compromised by the tremendous weight of people standing directly on it. Fortunately, it held. The primary element of the memorial complex is a 24-metre-tall, six-petal, flower-shaped concrete sculpture. Inside this structure is a crypt, the floor of which is lined with railway sleepers taken from the track that once brought prisoners to the camp. These sleepers are also used to form a pathway leading visitors to the monument, recreating the final journey of the victims. In the landscape surrounding the monument, large earth mounds mark the locations of the former camp buildings. Torture areas and graves are represented by shallow, undulating mounds and hollows. Several man-made lakes help to create a serene atmosphere of reflection. The “Flower Monument” complex is regarded by many as one of the most celebrated and striking genocide memorials in existence. On 2 July 1941, a secret meeting was held on top of the mountain of Kosmaj (55 kilometres south of Belgrade). Members of two separate partisan detachments, one from the the Kosmaj area, the other from the Sava river region, were brought together to form one cohesive unit. In November 1944, the brigade took part in the liberation of Belgrade; it then moved on to the Syrmian Front, driving the Germans out of Mandjelos and the Matore forest. In March 1945, the brigade was disbanded, having lost hundreds of fighters during the four years of its existence. In the late 1960s, designers Vojin Stojić and Gradimir Medaković were commissioned by the Yugoslav government to create a monument on top of Kosmaj Mountain. Completed in 1970, it honours the Kosmaj Partisan Detachment and those who died during the National Liberation War (as the Second World War is known). A wide concrete staircase leads from the road through the surrounding forest to the monument. The spomenik consists of five separate 40-metre-tall concrete double-pointed fins. On the ground at their centre is an engraved circular stone platform. Together the fins make a star-like shape echoing the red five-pointed star that the partisans added to the Yugoslav flag during the war. In 1941, with the region of present-day Kosovo occupied by Axis forces, the highly productive Trepča mines of Mitrovica were placed under the direct control of Nazi leader Hermann Goering. The miners quickly began to plan an uprising, forming the partisan-aligned Miners’ Troop. On 30 July 1941, workers detonated backpacks full of dynamite on Pillar 17 of the mine’s cable-car system, effectively halting production in all mines. Subsequently, the miners’ Troop headed north to join forces with the Kopaonik Partisan Detachment. In 1959, the architect Bogdan Bogdanović was commissioned by the Yugoslav government to produce a monument complex on Miners’ Hill in Mitrovica, to commemorate those fighters who participated in the Miners’ Troop. While the planning process for this memorial began in 1959, it was not completed until 1973. The design consisted of a 19-metre-tall trilithon structure, with two large conical fluted concrete columns supporting a concrete element reminiscent of the kind of ore-carts used in the mines. The two vertical columns were intended to symbolise Serbs and Albanians working together, both in the mines and in their fight against the German occupiers. The horizontal cart-like form was once encased in copper plates, but most of these have since fallen off or been stolen. At the base of the monument are several limestone plaques under which are buried the remains of fallen soldiers from the Miners’ Troop. Constructed around 1959, these pre-date the main monument. Once opened, this was one of the most popular cultural and historical attractions in the region, visited by thousands of people every year from across the country. The spomenik complex was particularly popular with the Young Pioneer movement whose members learned about the Partisan Revolution by travelling on pilgrimages to various historic sites around Yugoslavia. On 7 July 1941, a Serbian uprising against occupying Axis forces took place at Bela Crkva. Five days later, the Čačak Partisan Detachment was formed. This anti-fascist, communist and Serbian nationalist (Chetnik) group was one of the first armed and organised resistance groups in Serbia. During fighting, the Chetnik fighters betrayed the partisans over internal disputes, siding with the German troops on the eve of the fall of the town of Užice. Construction of this memorial to the Čačak Partisan Detachment began in 1967. 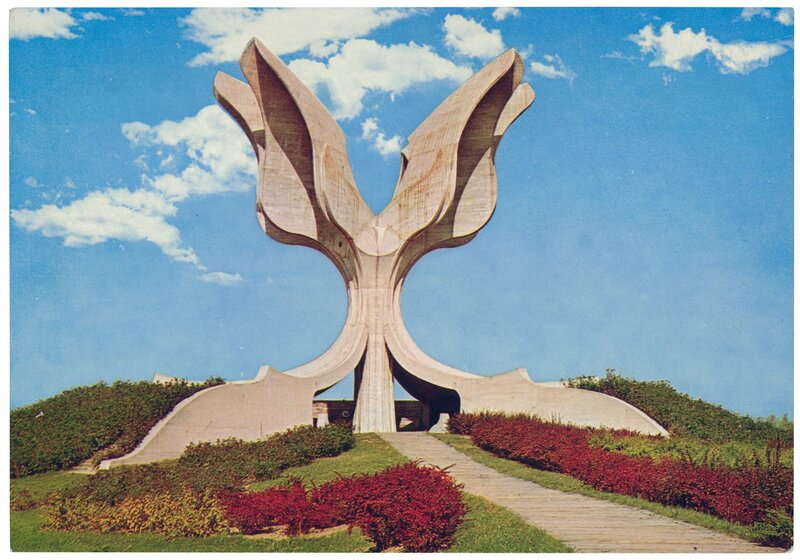 Designed by artist Miodrag Živković and architect Svetislav Licina, it was officially unveiled in 1969. The 10-metre-tall, sharply angled, aluminium monolith bursts from the ground, dramatically suggesting the sacrifice, suffering and valour of the fallen fighters. Its fractal motifs and stylised semi-abstract, angular human faces are typical of Živković’s work. On the paved approach, a text on a low triangular wall relates the story of the battle. Spomenik Monument Database is now available from FUEL Publishing. A launch event for the book featuring a Q&A with the author will be held at Calvert 22 Foundation on Thursday 27 September. Find out more here.